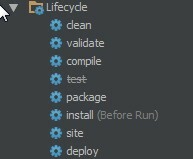 I started seeing the word "test" in the lifecycle crossed out recently. I didn't notice when it happened, but I'm able to run the lifecycle, and I'm curious what it means, and what might cause it. Ok... so I noticed that this flag is called when I actually run the lifecycle.. How do I change that? Found it, somehow this checkbox got checked. 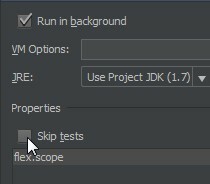 I unchecked it, and now there is no line through the tests in my maven window. For those wondering where this setting is it can be found in `Preferences -> Build, Execution, Deployment -> Build Tools -> Maven -> Runner` for IntelliJ IDEA 2017.1.